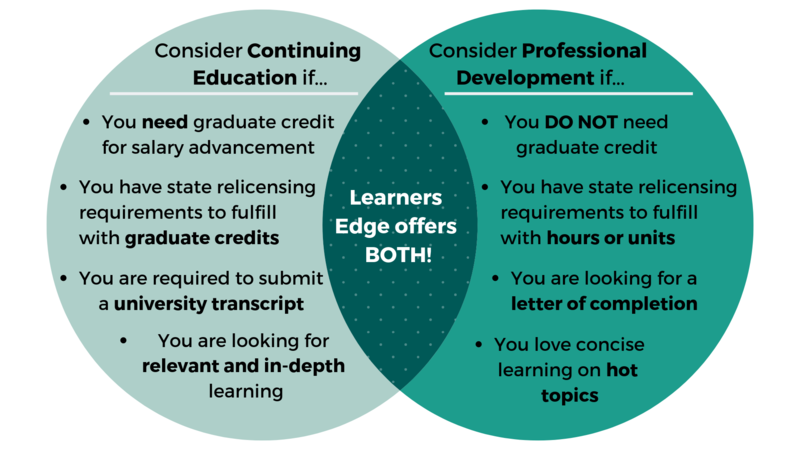 Below is a summary of how Learners Edge may help your continuing education and North Carolina educator license renewal needs. This summary should in no way release individuals from their responsibility of ensuring that the course they take meets their professional needs. We hope it provides assistance in understanding how Learners Edge might help you in the accumulation of clock hours or graduate credit for salary advancement and the North Carolina teaching relicensure process. See the North Carolina Department of Public Instruction website for complete NC teacher relicensure information. Teachers with 3 or more years of teaching experience, and are valid for five years. 3 renewal credits addressing literacy as defined in North Carolina General Statute. 2 general credits (not to include years of experience) at the discretion of the employing LEA. A unit of renewal credit is equivalent to one quarter hour or one in-service credit from a North Carolina public school system. A unit reflects ten contact hours. The DPI Licensure Section does not accept renewal credits of less than one unit. One semester hour is equivalent to 1.5 units of credit. To renew an expired professional educator's license, 10 semester hours or 15 units of renewal credit must be earned within the most recent five-year period.